Why do tomatoes get sick? Tomatoes are sometimes attacked by insects, fungus, viruses, bacteria, or a combination of these problems. They are especially vulnerable when stressed by environmental factors, such as temperature swings, excessive sunlight, or overwatering. Poor soil can also weaken their immune system, and contaminated soil can carry pathogens or fungal spores. Insects often spread disease as they travel from sick plants to healthy ones. For example, thrips often carry spotted wild virus and beet leafhoppers are the major carrier of curly top virus. Some tomato cultivars are naturally resistant to different viruses. If you live in an area where these pests are common, you may want to grow immune tomatoes from special seed packs. Before planting your tomatoes, ask your neighbors or local gardening clubs which problems are common in your area. The diseases that attack tomatoes can also attack other plants in your garden. Common plants such as potatoes, chiles, eggplant, peppers, and yams are vulnerable to the same pests and viruses. If you have a sick tomato plant, it is important to treat it quickly or remove the infected plant entirely from your garden to prevent the disease from spreading. Sick plants and diseased plant trimmings should not be composted unless you have a very hot compost pile that will kill off the pathogens. Preventative care is the best way to avoid sick tomato plants. This starts with providing a healthy environment for the plants to grow, with plenty of compost, the right amount of water and sunlight, and well drained soil. Another strategy to use is called “Companion Planting”. Companion plants are species that grow alongside tomato plants and provide natural protection against bugs and disease. Carrots, nasturtiums, and marigolds release scents that repel many insects. These plants make great neighbors for tomato plants and confer some natural protection. On a related note, you should avoid planting certain plants near tomatoes. Weeds such as tobacco, bull nettle, and jimsonweed can increase problems with flea beetles and tobacco mosaic virus. If these plants are near your garden, cut them back aggressively. Also, you can try “Sacrifice Planting”. Some plants are more attractive to common pests than the tomato plant is. For example, if you plant sweet corn on the other side of your garden, it will divert a large percentage of tomato fruitworms. After the insects lay eggs on the sweet corn, you can pull it out of the ground and eliminate the next generation of pests before they hatch. Again – be sure not to compost these scraps unless your composter reaches very high temperatures for a sustained period of time. If a high temperature composter is unavailable, your best options are to burn the infected plants or throw out the yard clippings in the city dump. Garden tools are also a possible source of infection. It is important to thoroughly clean and sterilize tools, especially if you’ve used them for trimming or digging up infected plants. Likewise, make sure to remove dead plants and leaf litter. Bacteria and viruses often lurk in yard debris. Before planting tomatoes, some gardeners “solarize” the ground. Soil solarization uses sunlight to heat up the soil to kill fungi such as Southern Bight, along with insect larvae and even weed seeds. It doesn’t take much to bake the soil in this way; just put a clear plastic sheet or pane of glass over the soil for several days when the sky is clear and the sun is bright. Solarization works best when you have a small area to treat and not a lot of wind. If your tomatoes still get sick after following all of these tips, you might want to consider using raised beds or hanging planters. These planters will physically isolate plants from the ground, which can prevent many types of insect attack and they also give more control over the dirt, which is critical for preventing soil borne diseases. Hanging planters are especially useful in humid areas where soggy soil is a problem – because hanging planters are more exposed, they have better airflow and can help keep tomato foliage dry. If you do get an insect infestation in a hanging planter, it’s also easy to remove that planter and isolate it from the rest of your garden. Harvest fruit quickly after it ripens. 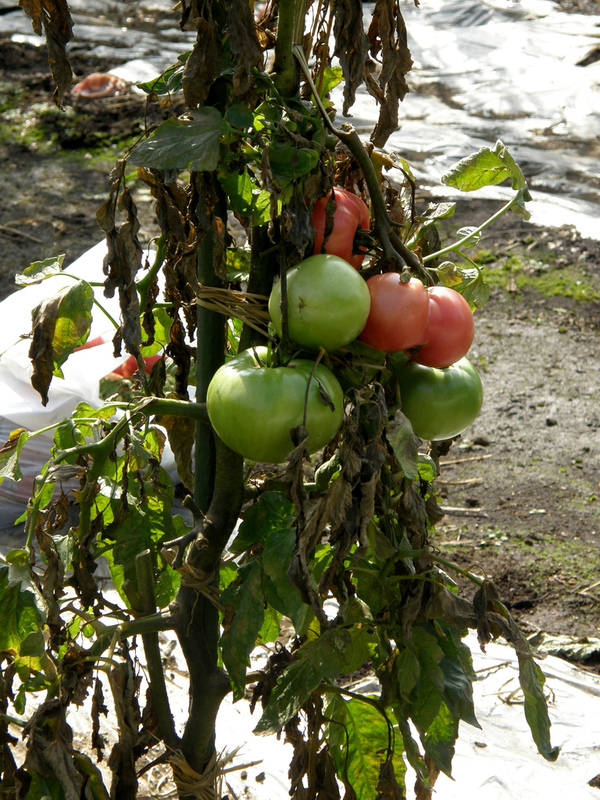 Overripe tomatoes attract pests and are more vulnerable to disease. Scrub and wash your tomatoes with soap after harvesting. This helps prevent fungus. Install a drip irrigation system to prevent fungus and ensure that your plants get enough water. Avoid pesticides that kill beneficial bugs: some insects are actually good for your garden because they eat common pests and fertilize flowers. These beneficial insects include lady bugs, parasitic wasps, honey bees, spiders, preying manti, and many others! Use compost that is fully decomposed. Unfinished compost can attract unwanted bugs, and may even get hot enough to injure the roots of your plants! Support your tomatoes with cages or stakes to promote air circulation. To prevent flower wilt or frost burn, only plant outdoors when temperatures are stable. Test the soil at least once a week and adjust the nutrients or watering schedule based on what you find. This electronic soil tester can measure soil pH, fertility, light levels, and moisture all at once. Pep up your tomatoes by replacing the nutrients that they need in the soil. A regular dose of organic liquid fertilizer will keep them nicely “fed”, and the ground could use 2 or 3 doses of bagged organic fertilizer to nourish the roots. Use a lathe or sun shade to reduce sunlight during the hottest times of the day. To protect against cutworms and other insects, you might want to try a wax paper shield around the base of your tomato plant.